← Photography in the Israel Museum. Can it be? 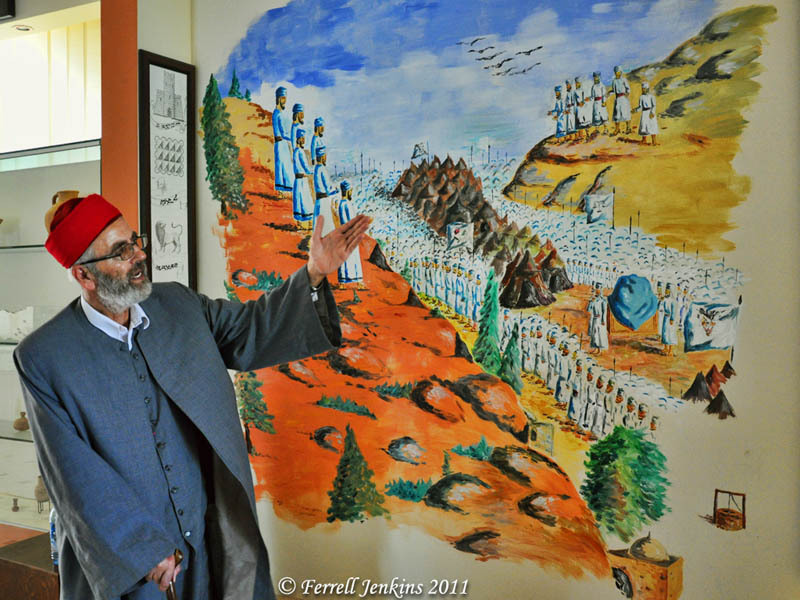 Last year I visited Mount Gerizim and the Samaritan Museum. Husney W. Cohen, a priest and director of the Museum, explained the Samaritan viewpoint about several biblical events. Samaritans believe the temple was to be built on Mount Gerizim rather than Jerusalem. They think Abraham offered Isaac on the mountain. They accept only the first five books (the Pentateuch) of the Old Testament. Cohen used a large mural to explain the Biblical account of the blessing and the curse. “It shall come about, when the LORD your God brings you into the land where you are entering to possess it, that you shall place the blessing on Mount Gerizim and the curse on Mount Ebal.” (Deuteronomy 11:29 NAU) cf. Joshua 8:33-35. Notice Jacob’s well in the lower right hand corner of the mural (John 4:5-6). Samaritan priest, Husney W. Cohen, explains the Samaritan view of the reading of the blessing and curse of the Law. Photo by Ferrell Jenkins. At one point during the visit the priest, who said he was third in line to become high priest, took us to an open window where we could see Mount Ebal across the valley to the north. View of Mount Ebal from a window of the Samaritan Museum on Mount Gerizim. Photo by Ferrell Jenkins. Robert J. Bull of Drew University excavated a site called Tell er Ras on Mount Gerizim between 1964 and 1968 when it was under the control of the Hashemite Kingdom of Jordan. His work uncovered evidence of Hadrian’s temple in the early second century A.D. In more recent excavations Y. Magen claims to have discovered the Samaritan temple destroyed by John Hyrcanus. In 1982 I visited the archaeological site on Mount Gerizim. In 2011 the road to the site was closed. In 2009 it was possible to drive to the site, but it was closed to visitors. 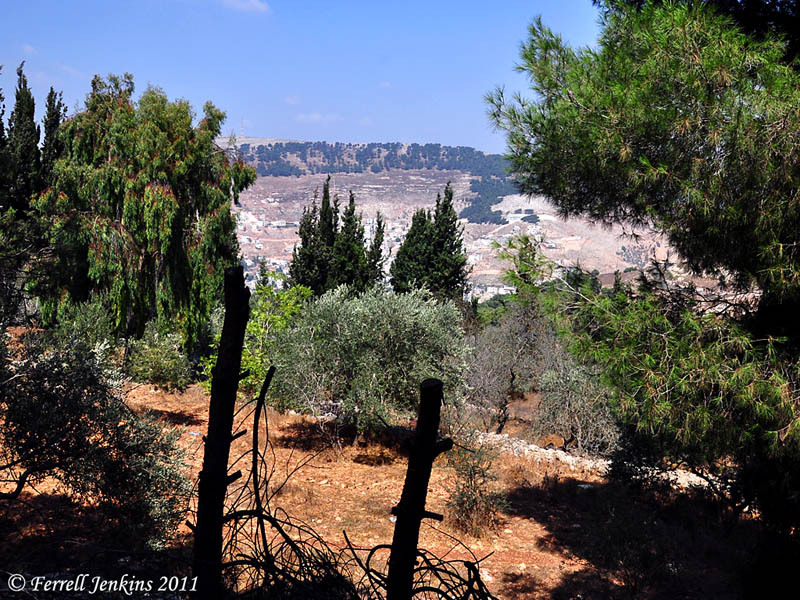 Here is a photo I made of some of the excavation and a Samaritan village on Mount Gerizim. 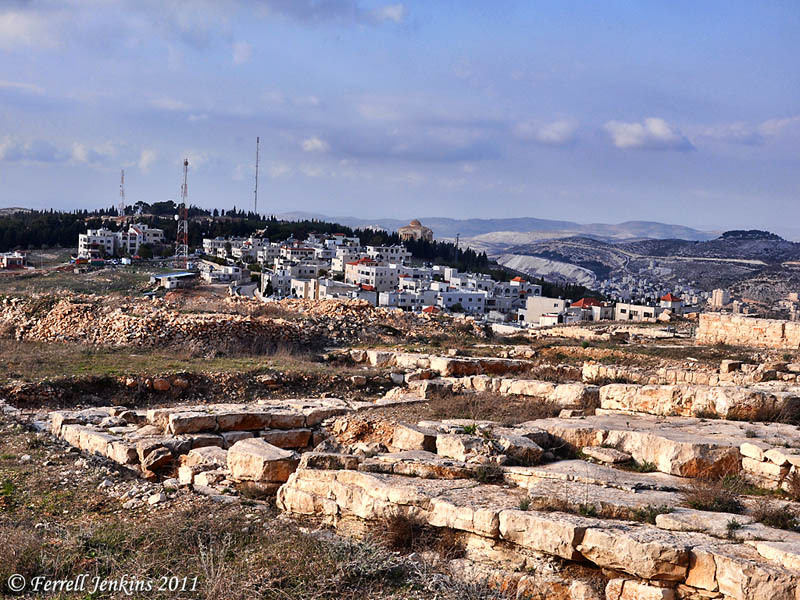 Archaeological site and Samaritan village on Mount Gerizim. Photo by Ferrell Jenkins. Two years ago we reported that the Samaritans wanted the archaeological site opened. See here. Now comes word that the site has been opened. No hours are given. See the Arutz Sheva article here. This whole area is of great significance to students of the New Testament. The conversation between Jesus and the woman of Samaria dealt with this issue. “Our fathers worshiped in this mountain, and you people say that in Jerusalem is the place where men ought to worship.” (John 4:20). Information about the Samaritan Passover may be found here, and here. This entry was posted in Archaeology, Bible Places, Bible Study, Israel, New Testament, Old Testament, Photography, Travel and tagged Ministry of Jesus, Samaritans. Bookmark the permalink.